I have to say, I’ve always had a thing about trains. Ever since I was a kid, I wanted a train set. Train travel is a little special. It gives you the freedom to walk around and enjoy the view, and what better time than in the fall, or for me, Autumn. Where I live in Queensland, Australia, I don’t really have a fall. It’s sub-tropical so we go from sweltering hot to a cool frost during winter. Our trees don’t really change colours or lose their leaves. 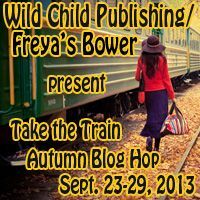 I have had the experience of a real fall, and while travelling by train. Way back in the eighties (yes, the dinosaur days as my son calls them), my husband and I travelled Europe by train. It was a wonderful experience rattling our way through the beautiful cities, valleys and mountains, or rather tunnels, amidst the autumn colours of the fall. I loved looking out the wide windows and watching the carriages behind snaking around the corners. The trains are so long, rarely did we see the end carriage. But this story has a unique little twist, one we still laugh about today. Under a beautiful, clear autumn day, Garry and I trained it into Venice. Arriving early morning, we’d decided to spend a day checking out the city before continuing on to Vienna. We held a Europass which allowed us unlimited train travel within a certain number of days, so we intended to get the most out of our pass and see as much of the country as we could. So, after an exhausting day in Venice, we returned to the train station for our overnight trip to Vienna. While we were waiting in line to board, we started talking to two young American students, Dave and Dawn. They were studying in Madrid for a year and had a few days off. They, too, were heading to Vienna. Thinking nothing more of it, we didn’t see them until we arrived in Vienna the following morning. As both of us were a little lost, we were drawn into conversation again. Having no plans, we told them our story of how we were using up our train hours and just wanted to say we’d been to Vienna (even if it was only for a few hours). They liked the idea so we teamed up and took a tour on a tram around the amazing city. We jumped off at different stops to check out buildings etc before the loop brought us back to the main station late afternoon. Our friendship with Dave and Dawn was growing, so much so, they decided to join us as we continued on to Germany. We got to know each other a little more on our trip north. Both were from Baltimore and had been going out as a couple for a while. Arriving in Munich, we decided to share the accommodation to save ourselves some money. For four days, we had a lot of fun with our new friends. It seemed like we’d known them for a lifetime and it was sad when it came time to say our goodbyes. They were heading north and we were going south into France to Nice. We had a good trip exploring the Riviera coast. Three days later we arrived at Paris’ Gare du Nord train station. We’d spent the night on the train to save on accommodation (times were tight back then). Arriving early morning, we left our bags in lockers and set out to explore beautiful Paris. We did all the touristy things including going to the top of the Eiffel Tower. It was actually its 100th anniversary and had a huge 100 sign attached halfway up it. At first we thought we were hearing things. We didn’t know anyone in Paris so surely no one would be calling my Garry. Turning, how wrong we were. Waving frantically was Dawn and Dave. Dave, being so tall, stood out without his long arms beckoning us. We were gobsmacked. Here we were, in a huge major train station in Paris, in the middle of peak hour, lost and trying to find our way out, when we stumble across Dawn and Dave who were just arriving. It was a one in a million chance of us running into each other at that particular time and that particular place. We couldn’t believe it. We pushed our way through the crowd to meet them, grinning from ear to ear. It was so good to see them. When we asked how they knew it was us, particularly from behind, they said they recognized our Akubras but called out just to make sure. Yes, both Garry and I were wearing Akubras. If you don’t know what an Akubra is, it was made famous by the Aussie movie, The Man from Snowy River (great movie: you should watch it if you haven’t seen it J). Anyway, an Akubra is a hat made from rabbit skins worn by farmers, drovers and stockmen. We booked into a room together and then, as Garry and I were so ‘experienced’, showed Dave and Dawn around. After dinner, we went back to the Eiffel Tower. It looked spectacular all lit up at night, especially with the 100 sign. We had an enjoyable and very memorable night. The following morning, we were booked on the hovercraft to cross the English channel to Dover. It doesn’t even exist anymore, not since they built the tunnel. We went through customs and walked down onto the beach. The officers generously let Dawn and Dave walk to the hovercraft with us. For the second time we had to say our goodbyes. As a token of our friendship, we gave them our train tickets to use up what we hadn’t. It was a great parting gift, one we knew struggling Uni students could definitely use. After all these years, we’ve stayed in touch with Dave who is married with two boys and living in Boston. Somehow we lost contact with Dawn soon after she and Dave split up. I have fond memories of our conversations and listening to music with them on the train in those wonderful countries we travelled through. For the past three years, young prostitutes and destitute women have been vanishing without trace. Their fates unknown, the only common links to their disappearances are their good looks and prison records. Never before has a cop been taken. Detective Billie McCoy, a member of an elite undercover squad, is on assignment when she stumbles onto a slavery racket that goes deeper than she could ever have imagined. Plunged into a web of corruption and evil, not only does she have to contend with the slave traders, but her fellow prisoners – all who hate cops. Stretching from the streets of Sydney to the rainforests in far north Queensland, it’s a race against time. Filled with determination, disappointment and twists, the story follows Billie’s fight for freedom and her greatest ever challenge. She will need all her cunning and skill to get out alive and see justice done. Blood will be spilt, hopes will be destroyed – all to uncover a plot so unpredictable that only fate can decide . . . .
Billie turned away. She leaned on the wall and stared up at the ceiling, torn apart. She was here undercover about to set up a big gun dealer and bring him to justice. If she helped this girl, it could blow everything. All the work she'd put into getting this close to the gunrunners could be in jeopardy. Her nature compelled her to aid someone in trouble. Damn it! Why did this have to happen now? She should just walk away and pretend she'd never seen it. After all, it had nothing to do with her. Yeah right. No way could she turn a blind eye to this. Turning back, she peered through the crack again. The redhead in the suit coat had pulled a small syringe from his pocket. The sight of it upset the distressed girl even more. She stared at it over the big hand clamped across her mouth, her eyes widened in horror. In a desperate bid to deter his intentions, she kicked out. Only by chance her knee knocked the redhead's hand. The needle rolled across the floor. He cursed. The ponytail man snarled. His large, gangly hand dropped from the girl's mouth, and he slugged her hard. The trapped girl grunted and sank in his grasp. The blow sent Billie into action. She couldn't leave the girl to these thugs. With a little luck, she could pull off both operations. Sneaking in, the detective picked up an old, wooden chair just inside the room. Although tempted to use her gun, silence was of the utmost importance. She couldn't afford to alert the men upstairs. They would be edgy enough, and the sound of a gunshot would certainly send them on a runner. Both thugs had their backs to Billie, their attention on their captive. Mumbling curses, the redhead's rising temper dampened his cautiousness. The chase brought him into the closest position to her. With the chair gripped in her hands, Billie jumped at the punk and cracked it over his head. The chair shattered into pieces. He moaned and collapsed to the floor with a heavy thud. His partner spun at the noise. He stared at her with a startled expression before turning a stunned look at his downed partner. Overcoming his surprise, he looked back up at her. The thug's lips twisted in a snarl. He dumped the girl to the floor. She fell in a heap. He lunged forward. Billie turned and faced him full on. She kicked up. Her heel smashed into his nose well before he could touch her. The guy's head rocked backwards. He recoiled with a couple of staggered steps. Billie followed, giving him no time to recover. Using the same foot, she buried it into his stomach. The impact doubled him over, driving the breath from his burning lungs. She stepped forward and brought up her knee, slamming it into the side of his jaw. He reeled sideways with a groan and collapsed, motionless. Billie looked at him, and then glanced at the other guy. Neither looked like they'd be moving for a while. She blew out a sigh and tossed the busted chair to the side. The detective crossed to the dazed girl and knelt beside her. She studied her face. A bruise already showed through on her cheek, marring her good looks. She lay relaxed in her enforced sleep, her features free from the strain they'd carried only a few moments before. Brown, shoulder-length hair bordered the girl's dainty face. A clean, fresh complexion enhanced her attractiveness. Long eyelashes guarded her closed eyes. She carried a 'girl next door' image, a guileless look that bathed her in a simplistic innocence yet held a disguised beauty to catch any man's eye. Her slender figure did her proud. Billie couldn't help wonder why she would be in a dive like this, or why these men were after her. She was a pretty girl and had a lot going for her, but something had definitely gone wrong for her to end up here and in this kind of trouble. The girl stirred, bringing the detective out of her thoughts. Her head rolled towards Billie. Her eyes flickered open. They looked glazed and confused. "Take it easy. You're safe now," Billie said, brushing a strand of the long, brown hair back off her face. The girl's confused gaze focused on her rescuer, and she tensed. She sat upright. Her gaze darted around the room in search of her would-be attackers. 'Hey, it's okay!" Billie took hold of her by the shoulders in a comforting gesture. Shooting her no more than a brief glance, the frightened girl stared at the unconscious men. They were no longer a threat. She turned back to the blonde kneeling beside her and relaxed in Billie's grip. "Are you okay?" Billie dropped her hands from her shoulders yet maintained a wary eye on her. The dishevelled girl nodded. "Yeah, I think so." She turned away from her and studied the men. After a lingering moment, she looked back at Billie. "Thank you very much," she said in a whisper. "Who-who are you?" Before the detective could answer, a voice from the doorway interrupted them. "So this is why they're taking so long." Billie's head snapped around in surprise. Three men stood in the doorway. Billie gave them a quick, assessing look. The guy in the middle, a short, plump, half-bald man in his late fifties stood with a thin smile on his lips. His gaze was fixed on her. His bright Hawaiian shirt boldly expressed his personality, loud and dominant. Short tufts of curly grey hair overflowed from the vee of the collared shirt. His round, beach-ball face was clean-shaven, like the top of his head. Only a strip of grey-flecked hair ran from one ear around the back of his head to the other. The other two flanked him, their bulky frames towering above him. Dressed like the two on the floor, they fell comfortably into their category: hired 'heavies'. These paid henchmen eyed her with guarded looks. The guy on the left of the fat man carried a scar down his right cheek. His hair was slicked back out of his face, leaving the dark, distrusting eyes in clear view. The third guy, a curly-haired blond, was shorter yet bulkier than his comrade. He stared with a blank expression set on his bristled face, clearly expressing his dislike. They stood protectively by their boss's side, like dogs on a leash waiting for a command to please their master. The little, fat man's gaze remained locked on the blonde girl in front of him. "My God." His astonished tone snapped Billie's attention back to him. She looked more closely, sensing something familiar about him. Her nerves stiffened. Suddenly, she knew. "Bates?" The name slipped through her lips before she could stop it. She'd failed to identify him in that first brief glimpse. The bright clothes and menacing conditions engulfing the tense situation had thrown her. He looked so different, and so out of place. She'd met this guy a couple of times, and both times he'd been dressed in a full suit, tie and all-back in police headquarters. So why would Captain Bates, head of Missing Persons, be here? Why would he be interested in this girl, especially in a place like this? And what was this well-respected police officer doing with these henchmen? Slowly, she stood, not taking her eyes off him. "What's going on here?" The young cop took a step towards him. "Ahh, what a pity, a sure pity." He sighed. His hand reached in through the open neck of his shirt and pulled a pistol out from under it. He dropped it to waist level, aiming at her chest. His tone may have held some remorse, but his actions didn't. 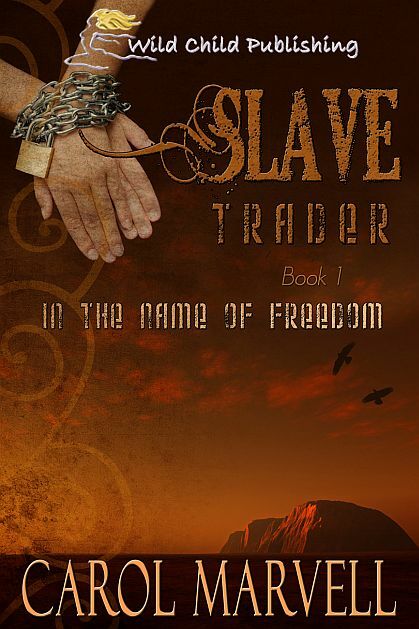 Click on any of these links to purchase a copy of Slave Trader – In the Name of Freedom. Great story Carol. I was in Paris in 1989 (high school trip) and saw the "100" lit up on the Eiffel tower. Then Garrison and I went 12/31/99 for the millinium. Our oldest son was born 9 months later =) Now we're taking the boys over the holidays. Fun reading so many train stories! Yep, that was the year. Makes me feel old ( I was already out of school). But yes, it is a very romantic city. We returned there with our three kids in 2009. For some reason, I enjoyed Paris much more this time. Maybe it was because we weren't roughing it :) Thanks for dropping by Terri. The only trains I've been on is the Durango-Silverton; the Amtrak from Seattle-Vancouver; and our fair train, which went from a town 10 miles north of the state capital to the fairgrounds. It was fun, learning how to move around while the train was in motion, esp when we ate breakfast on the Amtrak! It does take some getting used to. The hardest thing I found was trying to sleep in the upright seats. Thankfully we only did that a couple of times. It is still a great way to travel. Great story. And we just got that second red light five years ago. lol Loved your book excerpt, that's going on my wish list. I thoroughly enjoyed your great post. Thank you for sharing it with us! Glad you liked it, Carmen. It was a great trip.